My son turned 6 a couple weeks ago. It is crazy how fast times goes! Everyone told me this would happen- but I didn't believe them! 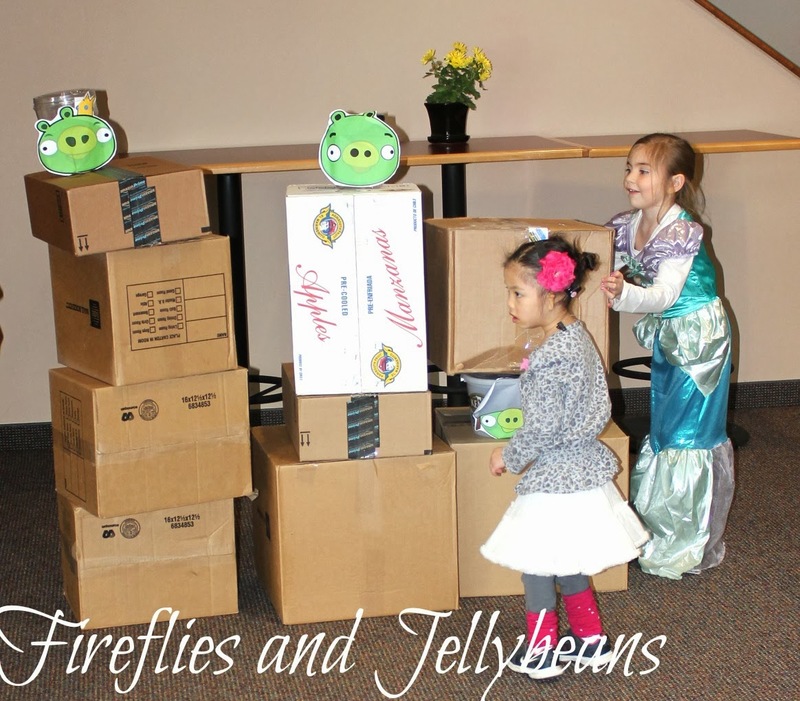 We threw an Angry Birds Party since that is what my son is into now-a-days. Since I have 2 other younger kids and one of them is 10 months we kept it really simple! 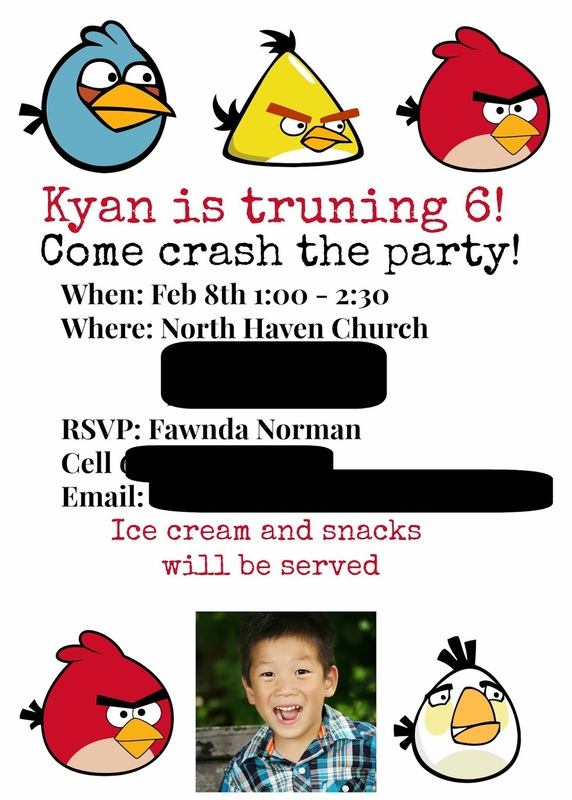 I made the invite using PicMonky and clip art from this FREE Angry Birds party download. (for personal use only!) There are all sorts of fun party printables in the download (that I didn't use because I was keeping it simple and my audience was 4-6 year olds!). I printed them as regular 4X6 photos and mailed them out. 1. I had the party at my church- it is free for members to use and it has a large area for kids to run and play so we could play more games (plus my house didn't get trashed by a bunch of kids!). Since it is February in Minnesota, outside is not an option! 2. The party only last 90 minutes... this was the perfect timing. The kids were done listening to me after 1 hour and 25 minutes! We played a couple different games to keep the kids moving. Since it has been a harsh cold winter here the kids all have cabin fever and need to get out and move! 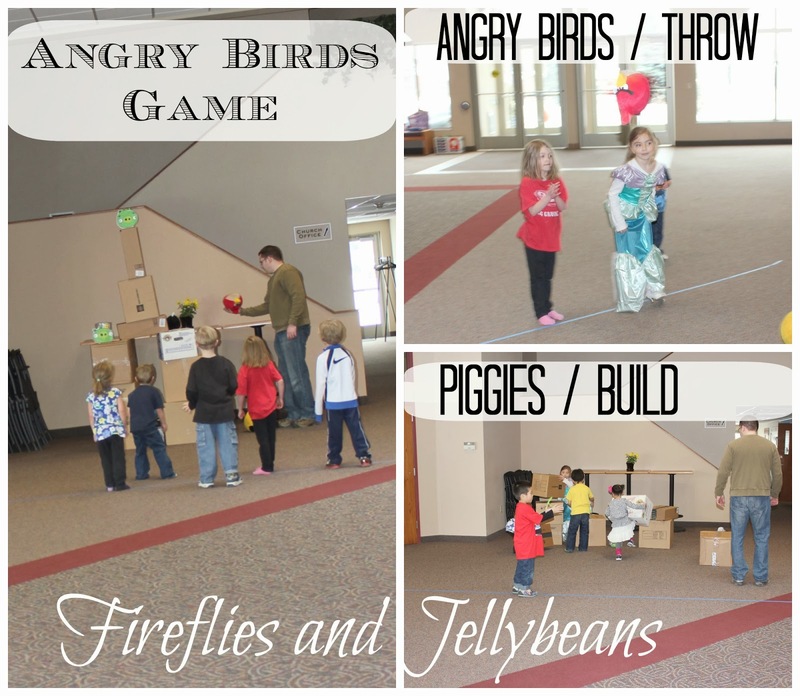 ANGRY BIRDS GAME- For real! For our first game we had to build some towers and knock them down - I mean this is Angry Birds right?! We had several boxes in our garage that we used for the towers. I also printed picture of the pigs on to regular paper and taped them to buckets for the Piggies. We spilt the group into 2 teams. They each took turns being the either the Piggies (who bulid the towers) or the Angry Birds (Who threw the birds to try and knock them down). 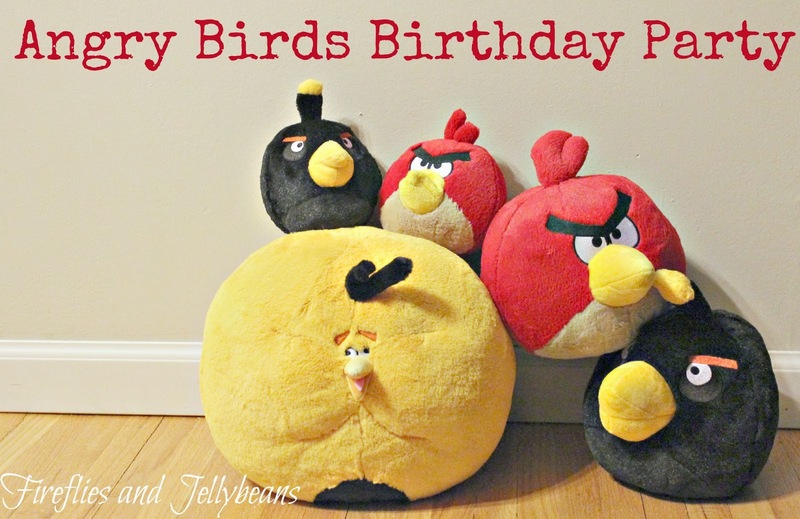 We bought Angry Birds Plush toys to use as the birds that we threw and these ended up being part of our son's birthday gifts. This was a blast and I think we could have done this the whole party and the kids would have been happy. And they were just as excited to build the towers as they were to knock them down. MR. PIG WHAT TIME IS IT? This is a version of Ships Across the Ocean - and also needs no props. One or Two kids are chosen to be piggies. They stand in the middle. The rest are Angry Birds- who are lined up on a line or wall. I yelled "Angry Birds- GO!" and all the kids ran across the room as the piggies try and tag them. If they get tagged they become a piggy too. The last 2 kids standing are the next rounds piggies to start. You can play several rounds! I got the mini-totes from Oriental trading co. I pre-cut all the shapes out of foam and bought the googley eyes and feathers from Michaels Craft Store (but you can also find them at the dollar store too). The kids arranged the faces and we helped the glue it on. These also ended up being their goodie bags! 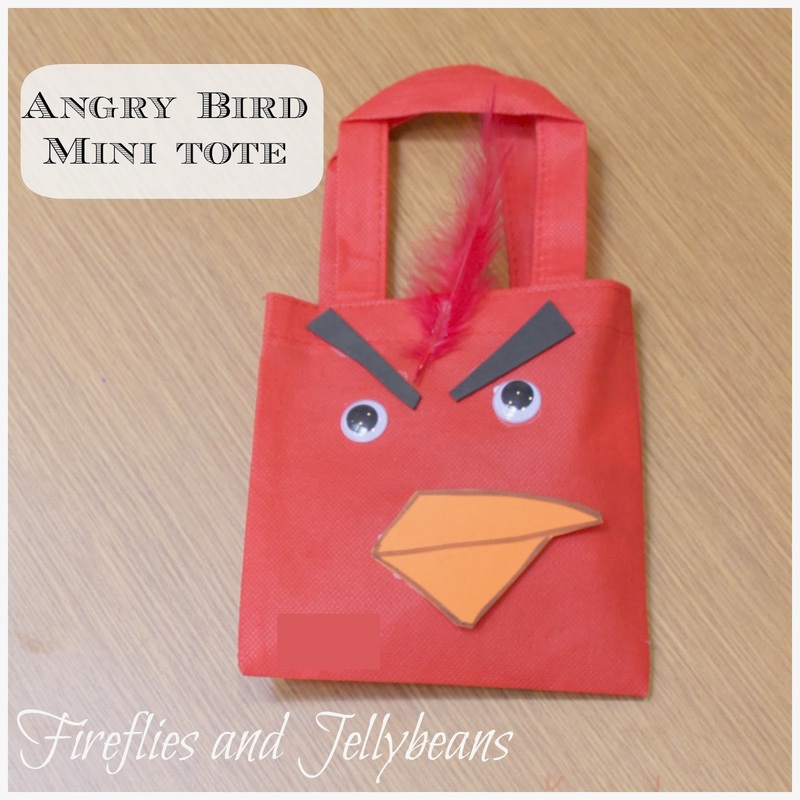 Since we were keeping it simple I did not do any cutesy Angry Bird treats. Like I said I have a 10 month old and 6 years don't care what the food looks like for the most part! 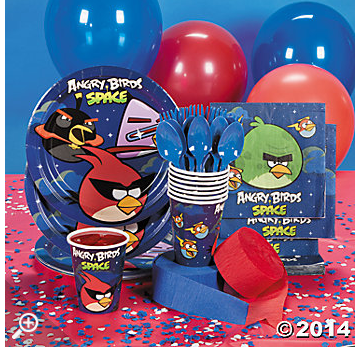 I just served some snacks on Angry Birds plates, napkins and cups that I got from Oriental Trading Co. I served fruit, chips and cookies. My son got the pick the snacks since it was his birthday - but I made sure that there were some healthy choices too. I got some decorations from Oriental Trading as well (seeing a pattern here?!) I didn't get a good pic of them since it was at the church. 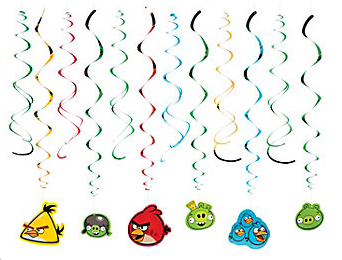 And I got these Angry Birds Hanging Swirls too - these were super fun! 1:40-1:50- Game 2 Mr. Pig What Time is it? 2:10-2:20- Game 4 Angry Birds Go! As you can see we really kept things moving! *I downloaded free Angry Birds Coloring sheets. I just googled "Free Angry Birds Coloring Sheets" and printed them off. We had a great time and at the end of the day my son told me: "Mom- this was the best day ever!" 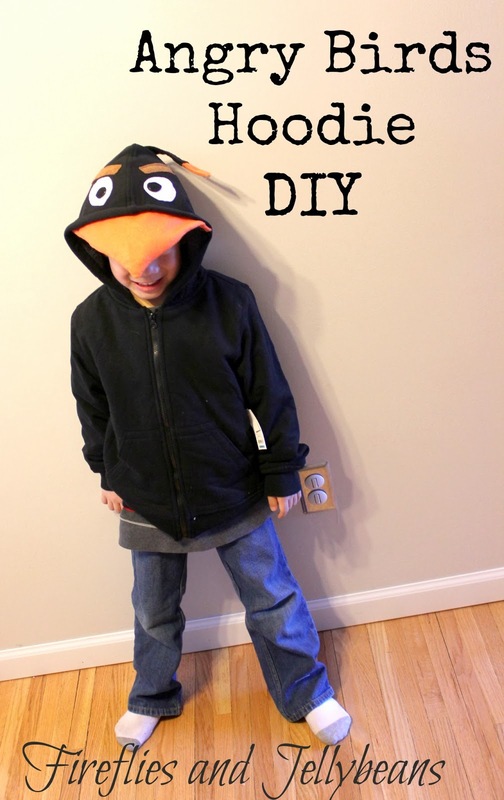 Also check out the Angry Birds Hoodie I made!